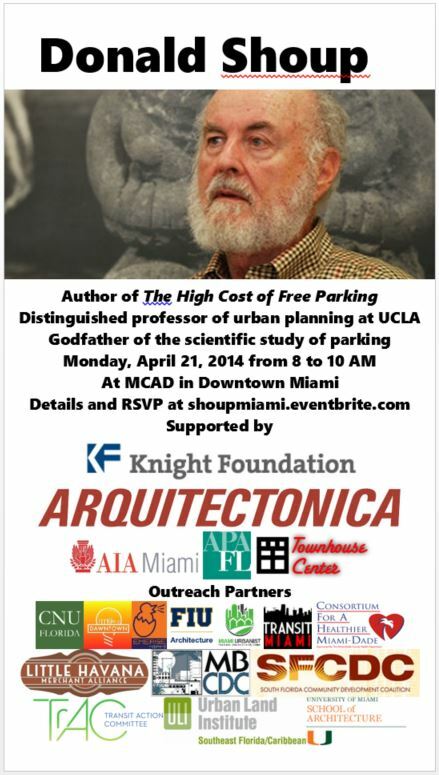 Donald Shoup, author of The High Cost of Free Parking and distinguished professor of urban planning at UCLA, will give a talk on Monday, April 21 from 8 to 10 AM at AIA's Miami Center for Architecture & Design, 100 NE 1 Ave, Miami, FL 33132. Shoup is the godfather of the scientific study of parking, and has spoken widely about the benefits of eliminating required parking for mobility and urbanism. Shoup writes: "This doesn’t mean, however, that developers won’t provide off-street parking. It simply means that urban planners won’t tell developers exactly how many parking spaces they must provide before they can get a building permit. Developers will provide the parking spaces they think buyers demand." Continental breakfast will be served. Supported by the Knight Foundation, AIA Miami, APA Gold Coast Section, and Townhouse Center. Capacity is limited, register now and tell your friends!